Jaisalmer is situated in the very heart of Rajasthan and a popular tourist destination therefore it is well connected to the rest of India and Rajasthan with airways, railways as well as roadways. Jodhpur is wel connected with all major city of India. U can get train from Jodhpur very easily. Jaisalmer is well connected to the rest of state by well-maintained roads. Due to its proximity to Indo-Pak boarder, special emphasis is given on its maintenance. Deluxe & Ordinary buses of Rajasthan Roadways & Private companies operate from Jaisalmer to Jodhpur, Jaipur, Bikaner, Barmer, Mount Abu, Jalore, Ahemdabad etc. Roadways main bus stand opposite Railway station & Golden bus terminal near State Bank of Bikaner and Jaipur, Shiv road, Jaisalmer are the two major bus stands. The ideal time to visit Jaisalmer is from October to the month of March, although the city remains bustling with tourists throughout the year. 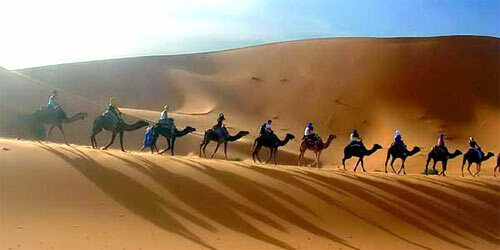 If you are here not for mere fun but to try for adventures then Jaisalmer is worth visiting round the year. Nevertheless, in summers there are chances you might get affected with heat stroke. It is very clean and friendly city, Good hotels available ranging from budget to five star resorts. One of the most magnificent attractions is the Jaisalmer Fort known as the "Sonar Kila" due to the yellow stone it was built out of. Sam desert safari - excellent experience. Fossil Park and fort visit a life time memory. Do go for sand dunes, a nearby destination for camel safari...try to opt for stay there to enjoy rajasthani folk dances n songs... bargain for night stay...not more than 800-1000/person ...including night stay, dinner, camel safari n back to jaisalmer... there are many cultural things to buy. The Khuri & Sam Sand dunes are must watch. Sam is really a commercial hub and situation is really bad. The moment your vehicle approaches Sam be ready to face lot of persons running (banging) towards your car. This is dangerous because they seemed not to be bothered about their life. Just manage to avoid this rush and keep going straight. You can stop after about 1 kms from that place and then you will find few owners of camels approaching you. The rate varies from Rs 75 to 150. Do not get fooled by their story of Thar Desert, films shooting, deer sittings etc. Depending on time in hand just hire it. Khuri that way is a much quieter and cheaper option. Though the dunes are not that cleaner then in Sam but they are good. Also visit Kuldhara village on the way to Sam. One more village which is not very famous is Khaba Fort. This is also one the 84 abandoned villages and is much better than Kuldhara. It’s straight on the road after Kuldhara and then takes you back to the Sam road. The Khaba Fort is also good giving you good sight of the village. Then the Jaisalmer Fort, Jain temples and Havelis are also must watch. If possible hire a authorized guide for around Rs 250 for half day trip. This helps you in getting the insight of this beautiful city. Artist Hotel (Royal Guest House), Artist Colony, Jaisalmer, 345001. Ph- 02992-252082, Built for fun and cultural exchange. The profits go towards a social cause. Rooftop Restaurant offers best food in town - and Live music nearly every night.....best place to go! Rs. 180-600. Hotel Jaisal Palace, Behind Royal Palace, Gandhi Chowk, Ph- +91- 2992 - 252717 checkin: 12.00 Noon; checkout: 12.00 Noon. from 600 to 2100. Hotel Shree Govindam (A Budget Class Hotel), Near Hanuman Circle (Geeta Ashram Road), Ph- +91 9414150528 check in: After 11 AM; checkout: 9 AM. Lots of local eateries which offer sumptuous lunches and dinners for a measly Rs 20. 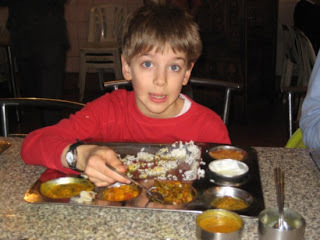 Do eat at...hotel desert boy (jaisalmer) for lunch n dinner ...it has mouth watering thali...worth eating. Artist Hotel Restaurant Near the sunset view point - in the middle of the Jaisalmer artist colony. The very best food in town(50Rs). Seema Restaurant Just outside the fort. Really good and cheap food (50Rs). Bandhni saris and dress materials and Camel leather items worth buying. All rajasthani jewellery is more attractive there. Fort visit, Haveli visit, Camel Ride to Sand Dunes, Desert Jeep Safari, Staying in Swiss Tents at Khuri village, Watching Sunset and Sun rise. Sightseeing. Go during winter months. Delhi people can drive down to Jaisalmer via Jaipur and Jodhpur. Ahmedabad People can also drive via Mehasana, Palanpur. 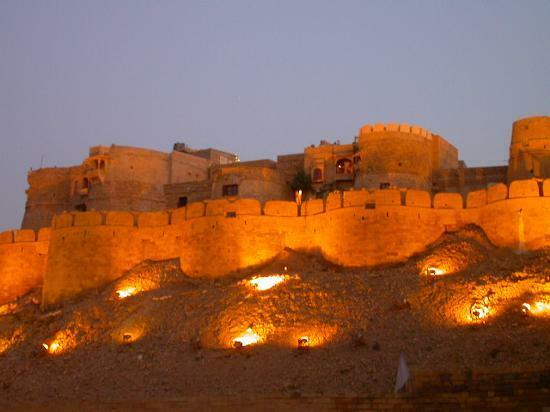 Jaisalmer has a hot and arid climate and is very hot in daytime during the summers but as the night falls, typical of the deserts, the temperature cools down dramatically. Therefore the clothes must comply by the weather condition prevailing at the time of the visit.